From the corn dogs to the ferris wheel, there's just nothing quite like a county fair. 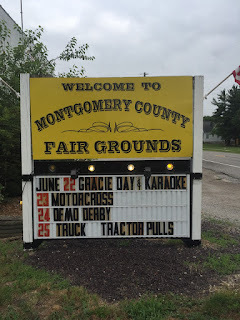 I've been fortunate enough to be around the Montgomery County Fair for nearly all my life. Through my years in 4-H and working for the newspaper, I've spent more hours at the fairgrounds in Butler than I can count. But tonight was different. Tonight was a special night, because it was Grace's night at the fair. We were SO excited for Gracie's night at the fair. 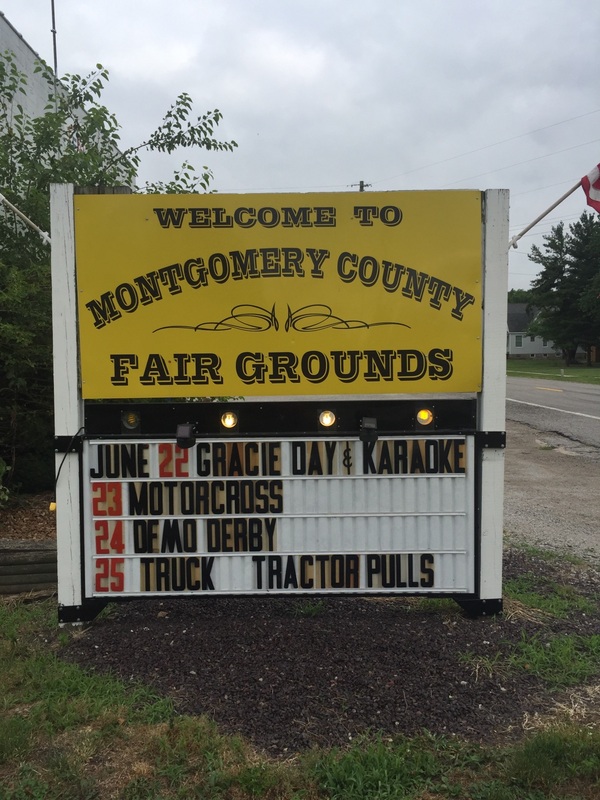 A few weeks ago, I saw a news item come across the counter at the newspaper office for the fair, designating Thursday night of fair week as Gracie's night. 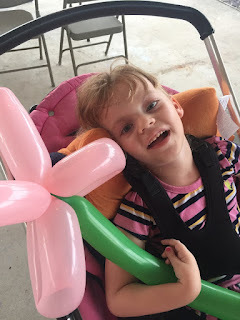 That night, they would provide a variety of free activities for kids and families, and $1 from the price of every admission would be donated to INAD research. Kyle and I were both so honored by their decision. Grandma and Grandpa Galer came out to eat at the fair. But it's not the first time the fair has supported INAD research. 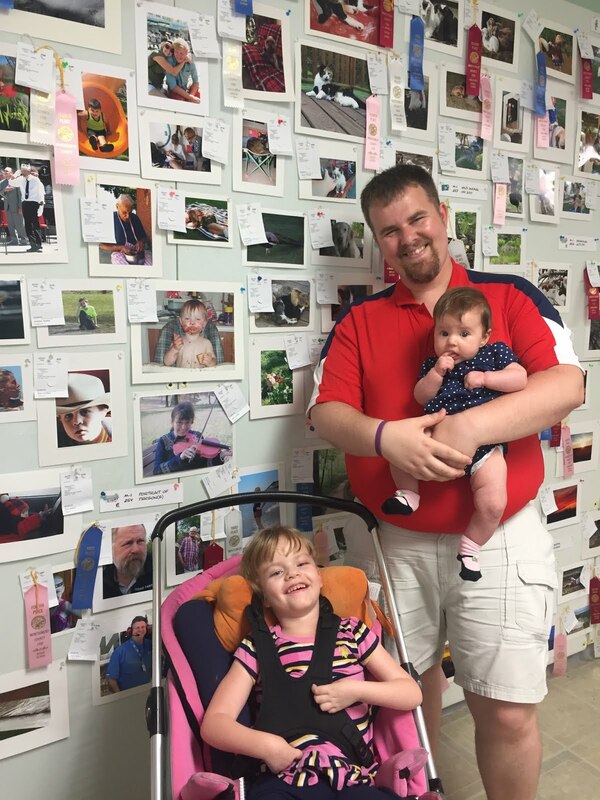 Two years ago, they held a 50/50 drawing during the demolition derby, the busiest night of the fair, and donated about $200 to research. Unfortunately, we had to cover another assignment and didn't get to go out that night. 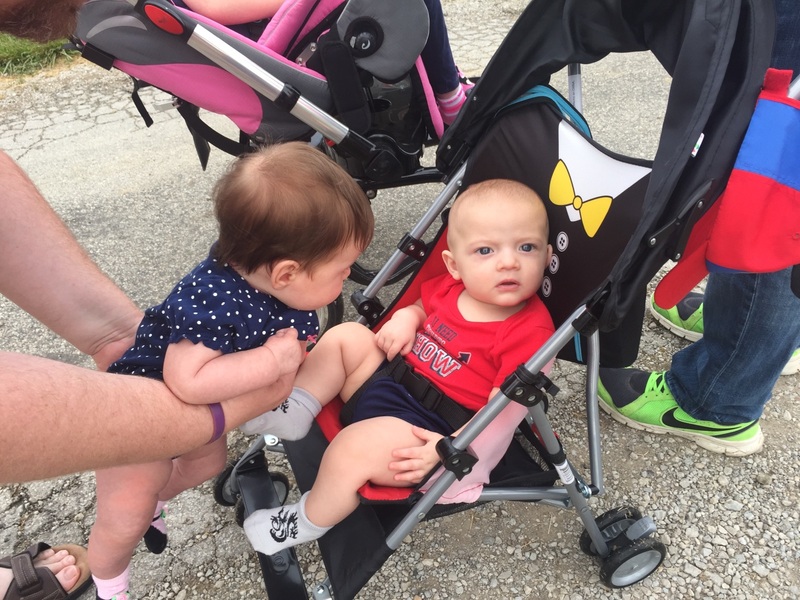 Charlotte got to meet Silas at the fair. 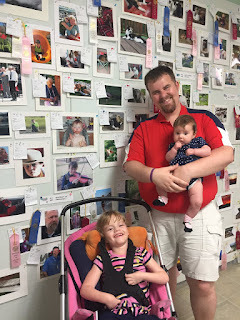 So, we were really excited that we had the chance to take Grace and Charlotte to the fair for Gracie's night. 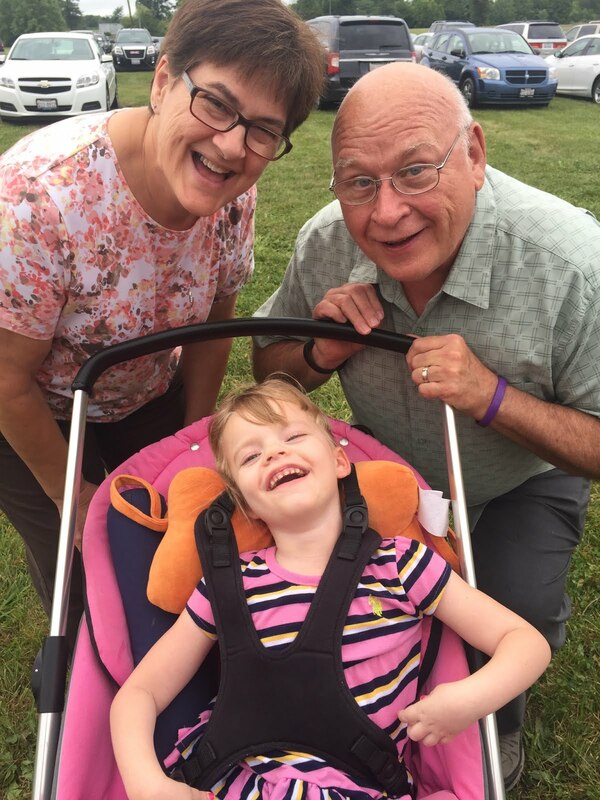 Although it was Charlotte's first fair experience, Grace is already an old hand at fair activities. From cow shows to carousel rides, she's enjoyed several fair experiences with us. Checking out the photography exhibit together is one of our favorite activities! After Grace and Charlotte were fed, we headed out to Butler tonight in time for Kyle and I to grab some sandwiches from Sweet Addictions. And they were fantastic. We also took time to walk around the Arts and Crafts expo to see this year's exhibits of collections, photography, quilts, vegetables, flowers and more. We stopped to check out the Hillsboro FFA games, including a pedal tractor pull, which was also raising donations for INAD research. Professor Longhair and Mys Jill were making balloon animals, and they made a pink flower for Grace, who smiled from ear to ear when they gave it to her. 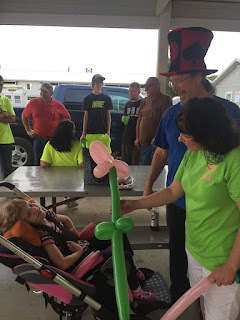 Professor Longhair and Mys Jill gave Grace a pink flower balloon, and she just smiled. Grace loved her new flower balloon! We continued to walk around for a little bit, and Charlotte managed to fall asleep in Kyle's arms. She wore herself out from all the fun at this year's fair. 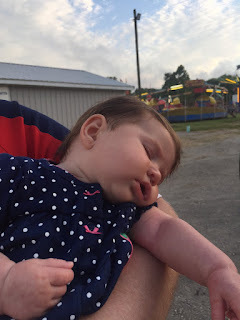 Charlotte got worn out at her first fair. But the best part of hanging out at the fair tonight was the people. We saw some coworkers, who brought their two boys and wore Grace shirts to the fair. It was fun just to stop and talk to people and thank them for coming out to show their support. Grace even got her photo taken with the new fair queen before we left. 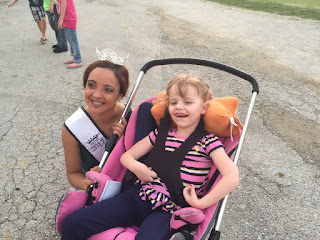 Grace got to meet Queen Robin before we left the fair! We continue to be amazed by the outpouring of love and support from our communities and beyond, who help us raise awareness and funding for more research. Each and everyone of you is a special part of our Grace-Filled Journey, and together we will #beadINAD.